At Nu Flow, we practice hydro jetting, a drain cleaning service that involves the use of ultra high-pressurized water to scour sewer pipeline walls clean of debris, greasy clogs, and tree root blockages. This service is invaluable for removing troublesome, dense clogs as well as rehabilitating your pipes by completely cleaning them of debris along the walls and restoring their diameter, and we are proud to offer a versatile cleaning solution for our customers residing in Tucson. Symptoms of a blocked or heavily corroded sewer pipeline includes slowly emptying drains, sewer odors emanating from a bathroom, or wastewater backups into the building. These symptoms can create a fear of overbearing repair costs and torn up landscaping in the mind of a homeowner, but when you call Nu Flow for assistance, you can rest easy knowing that our work is reliable and meant to last. After an initial inspection is performed to identify the location of the clog, its size, as well as other factors including debris accumulation along the pipeline diameter, the technician utilizes the buildings outside cleanout point within the sewer line to introduce the water line and nozzle into the pipe. The outside cleanout point is a capped, short access pipe connected to the underground sewer pipeline. It is generally located near a building wall. It was put in place when the pipeline was originally installed during the building’s development. Homeowners do not need to know where the outside cleanout point resides. It will be easy for our technician to locate, basing their assessment on the position of the kitchen and bathroom within the building. Hydro jetting is performed using a high-pressure water pump, a thin, flexible water line, and a rotating nozzle that contains tiny water jets. 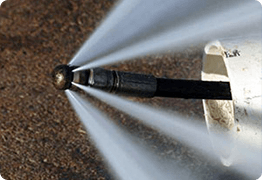 Water is sprayed from the nozzle with extreme force, allowing the pressurized water jets to blast blockages apart, even strong invasive tree root balls, and rinse them down the pipeline. The water pressure pushes the unwanted materials down the gravity fed sewer pipeline. The corrosion that builds up naturally within a pipeline over time is also stripped away. When the process is complete, the entire interior wall of your Tucson pipeline is smooth and clean, and all unwanted materials have been pushed away into the public main sewer line.This process is designed to take advantage of the way sewer lines are buried and eliminate the requirement to dig out the pipes. The lines are generally buried with the purpose of using gravity to pull wastewater out of the building and into the public sewer system. Hydro jetting makes use of this slight slant of the sewer pipeline, with the water being forcefully blasted against any blockages and rinsing them down your Tucson pipeline until they are pushed into the public sewer line system running under the street. The hydro jetting hose and nozzle can be unspooled into the pipeline far enough to allow the entire pipeline to be flushed and scoured clean. Our knowledgeable team is well versed in every method of trenchless pipe repair. Our team of dedicated staff members will be happy to assist you with the most cost-effective and swift, trenchless method of solving any sewer pipeline concern. Contact Nu Flow today and schedule an appointment with our Tucson team’s expert trenchless pipe repair personnel. Reach a qualified support representative by filling out the form below or calling us directly at 520-284-0056 and we'll be happy to assist you with all your repairs.